Griftan Number GT-11 Fine Thread Safety Cap for High Pressure Cylinders. 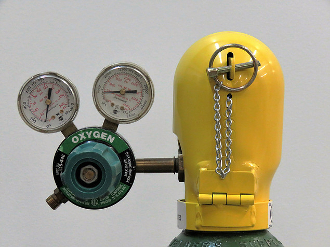 The Griftan Safety cap protects high pressure cylinder valves even while in use! No need to disconnect the regulator, just open cap, shut off valve and close the cap. Makes your work areas safer where cylinders are used. Heavy duty construction meets DOT, OSHA, MSHA requirement. To help prevent theft of regulator, simply replace lynch pin on the Safety Cap with a #3 Master Lock. Made in America.